CONGRATULATIONS WINDY, JASON, AND JOSH! A dream came true for Windy Adlon and her husband, Jason Hilliard, on Monday, March 2, 2016. 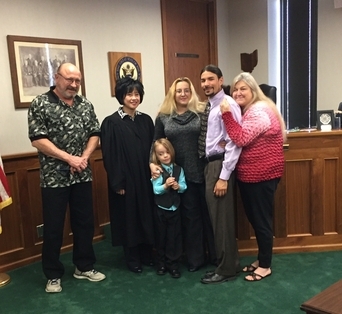 Windy and Jason became foster-to-adopt parents with The Twelve of Ohio, Inc. in October of 2013. They had made the decision that they would like to add to their family and provide a loving home to a child. Josh was placed in their home, as a foster child, shortly after Windy and Jason became a licensed foster home. They were extremely excited to be chosen to care for this little four year old boy. Josh was a fearful child, having experienced so much trauma and loss in the first few years of his life. Windy and Jason, along with Windy’s parents and close family friends, welcomed Josh into their family with open arms. Over the last year and a half, the Adlon-Hilliard family showered Josh with nurturing love and several social, educational, and family experiences. With the unconditional love of family, Josh has blossomed into a confident, extremely loving, and smart preschooler. 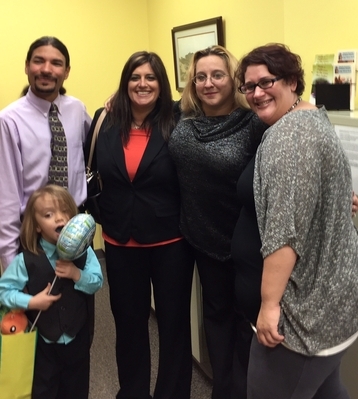 On March 2, 2016, it was evident, by the sparkle in his eyes, that Josh’s dream also came true, when his adoption into Windy and Jason’s family was finalized in court. The Twelve of Ohio, Inc. would like to Congratulate Jason Hilliard, Windy Adlon, and Joshua Jason Adlon on their “Best Day Ever” Adoption Day! Thank you all so much for reminding us why our jobs, and people like you and us, are so important!